Family physician practising in Chisasibi, Que, and a part-time Clinical Faculty Lecturer in the Department of Family Medicine at McGill University in Montreal, Que. Cardiopulmonary resuscitation–induced consciousness (CPRIC) is a phenomenon that is receiving increasing attention, and of which family physicians and all care providers with advanced cardiac life support skills should be aware. It has been hypothesized that owing to a variety of physiologic variables, such as autoregulation, comorbidities, and cerebral ischemic thresholds, it is possible for patients receiving high-quality cardiopulmonary resuscitation (CPR) to maintain consciousness.1–3 The case presented here is of a younger man who appeared to regain consciousness several times during CPR. A 38-year-old man presented to the emergency department in a remote regional hospital staffed by family physicians. He had a 4-hour history of retrosternal chest pain radiating into his neck. In the hour before presentation the patient had also developed lightheadedness and diaphoresis. The patient had type 2 diabetes, for which he took no medications, and he smoked approximately 10 cigarettes daily. He also had a relevant family history of coronary artery disease and early myocardial infarction. On presentation the patient was alert, pale, diaphoretic, and visibly ill. Vital signs were taken at triage and the patient was found to have a blood pressure of 83/50 mm Hg and a heart rate of 34 beats/min. 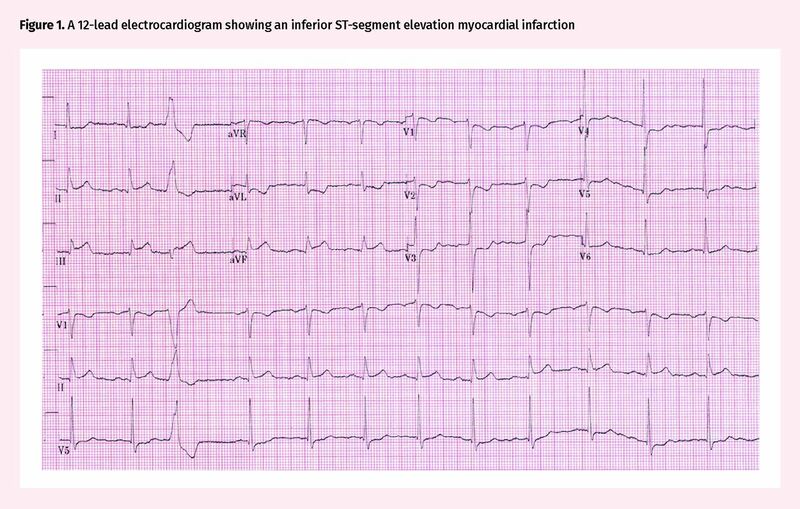 He was transferred to the resuscitation room and a 12-lead electrocardiogram was obtained, which showed an inferior ST-segment elevation myocardial infarction (Figure 1). The patient was immediately administered 320 mg of acetylsalicylic acid to chew, 300 mg of clopidogrel by mouth, and a litre bolus of normal saline intravenously for a suspected right ventricular infarct. After receiving fluid resuscitation the patient’s blood pressure and heart rate were 158/107 mm Hg and 77 beats/min, respectively. The anticipated transfer time for percutaneous coronary intervention for this patient was approximately 5 hours, and the patient had no contraindications to thrombolysis; therefore, the decision was made to attempt coronary thrombolysis with tenecteplase. Approximately 7 minutes after receiving tenecteplase the patient became unresponsive, with no pulse, and polymorphic ventricular tachycardia (VT) was identified on the cardiac monitor. Chest compressions were immediately started and the patient was defibrillated 1 minute after cardiac arrest with 200 J. Table 1 provides a summary of the resuscitation, including likely episodes of consciousness. The patient had return of spontaneous circulation (ROSC) at 8 minutes but this was not sustained. The rhythm on the cardiac monitor varied from polymorphic VT to ventricular fibrillation to VT (Figure 2). The patient was ultimately defibrillated 6 times and received 3 mg of epinephrine, 2 g of magnesium sulfate (for suspected torsades de pointes), and 300 mg of amiodarone. At several points during the resuscitation the patient regained some consciousness. He made purposeful movements to push CPR providers away and verbalized with defibrillations. When signs of consciousness were recognized, CPR was immediately stopped and pulse checks were performed. During pulse checks there was no palpable pulse and the patient lost consciousness shortly after cessation of CPR. The decision was therefore made to continue CPR and defibrillation attempts, and a 4-point restraint was applied to prevent interruptions to CPR. Return of spontaneous circulation was ultimately reobtained 17 minutes after the patient initially went into cardiac arrest. He eventually became fully conscious and was able to speak with family members before being intubated in preparation for transfer to a tertiary care facility. The patient was transferred, received rescue percutaneous coronary intervention for acute occlusion of the circumflex branch of the left coronary artery, and was ultimately discharged from hospital 4 days after cardiac arrest. He had complete neurologic recovery at the time of discharge. When interviewed 3 months later about his recollection of his resuscitation, he recalled experiencing discomfort in his chest and neck, and that he felt 2 “shocks” that made his muscles tense. He had no recollection of CPR specifically and denied any recollection of pain. Although the patient’s outcome in this case was positive, several care providers who participated in this patient’s resuscitation reported feeling personal distress during the resuscitation. None of the care providers had ever experienced a patient regaining consciousness with CPR, nor were they aware that it was possible. They were therefore uncertain whether the case had been appropriately managed and whether the patient should have been sedated rather than restrained. Cardiopulmonary resuscitation–induced consciousness is a newly identified phenomenon of increasing incidence and might be related to early high-quality CPR in younger, healthier patients.5 Care providers should be aware that CPRIC can occur and that although it can be distressing to care providers, CPRIC is associated with improved survival. Once identified, the priority in the management of CPRIC should be the continuation of high-quality CPR with minimal interruptions. Physical restraints and patient reassurance might be required to minimize interruptions to CPR and continue effective resuscitation, as was done in this case. Few survivors have any recollection of their resuscitation. If needed, ketamine might also be used to sedate the patient to minimize CPR interruption, but further research is needed to confirm its safety and appropriate dosing in CPRIC.4 Hypotension-inducing medications should be avoided. Further research is required to determine the frequency of CPRIC in Canada and to develop guidelines on how to best manage this condition. ▸ Advanced cardiac life support providers should be aware that cardiopulmonary resuscitation–induced consciousness (CPRIC) can occur and is being reported with increasing frequency. ▸ Although it can be distressing to the care providers, few survivors of cardiac arrest with CPRIC have any recollection of their resuscitation. In fact, CPRIC is associated with positive patient outcomes. ▸ Physical restraints and patient reassurance might be required to minimize interruptions to CPR in patients with CPRIC. Medications for sedation can also be administered, but those that can induce hypotension should be avoided. ▸ Les prestataires de soins spécialisés de réanimation cardiorespiratoire (RCR) devraient être au fait de la possibilité qu’une reprise de conscience provoquée par la réanimation cardiorespiratoire (RCRCR) puisse survenir, et que de telles situations sont de plus en plus souvent signalées. ▸ Même si ce phénomène peut être bouleversant pour les prestataires de soins, il y a lieu de mentionner que peu de survivants à un arrêt cardiaque ayant repris connaissance durant la RCR se souviennent de leur réanimation. En réalité, la RCRCR est associée à des résultats favorables chez les patients. ▸ Il peut être nécessaire de recourir à des mesures de contention physique et de rassurer le patient pour minimiser les interruptions de la RCR chez les patients qui reprennent connaissance. Des sédatifs peuvent aussi être administrés, mais il faut éviter ceux qui peuvent induire une hypotension.
. Return of consciousness during ongoing cardiopulmonary resuscitation: a systematic review. Resuscitation 2015;86(1):44-8. Epub 2014 Nov 4.
. The roles of cerebral blood flow, capillary transit time heterogeneity, and oxygen tension in brain oxygenation and metabolism. J Cereb Blood Flow Metab 2012;32(2):264-77. Epub 2011 Nov 2.
. Cerebral blood flow threshold of ischemic penumbra and infarct core in acute ischemic stroke: a systematic review. Stroke 2006;37(5):1334-9. Epub 2006 Mar 30.
. CPR induced consciousness during out-of-hospital cardiac arrest: a case report on an emerging phenomenon. Prehosp Emerg Care 2017;21(2):252-6. Epub 2016 Oct 28.
. Prolonged retention of awareness during cardiopulmonary resuscitation for asystolic cardiac arrest. Neurocrit Care 2008;9(3):382-6.
. CPR-induced consciousness: a cross-sectional study of healthcare practitioners’ experience. Australas Emerg Nurs J 2016;19(4):186-90. Epub 2016 Jul 29.
. Consciousness induced during cardiopulmonary resuscitation: an observational study. Resuscitation 2017;113(4):44-50. Epub 2017 Feb 1.
. AWARE—AWAreness during REsuscitation—a prospective study. Resuscitation 2014;85(12):1799-805. Epub 2014 Oct 7.